Anyone that knows me well knows I love to read. I normally read 10-14 trade magazines a month, many cover to cover. I also try to fit a few good books in there as well. My theory is that things change so quickly in our field, and there is always something new to learn. In addition to the old standbys I've been reading for some time (Front of House, Live Sound, Pro Sound News, Church Production, Technologies for Worship, Digital Content Producer, Videography, Post, Studio, among others), I've recently been reading through some new ones. As you might expect, the focus of this mag is on lighting and sound (those magazine guys are so clever!). They cover various topics related to the entertainment industry. The current issue has an article on the Rascal Flats tour, a Mary Kay Convention, Disney's High School Musical tour, and Club Med Cancun. I find I don't read every article, but there are some great ideas for stage design and I find it always pays to find out what equipment is being used by touring companies and installers. Check it out, you can probably qualify for a free subscription. 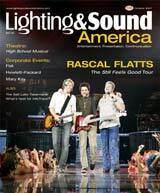 This mag focuses primarily on stage and lighting design. Again, there are some great ideas here for churches. The current issue has articles on Eric Clapton's Concert at Crossroads benefit, the future of club lighting, TWFM's presence at LDI, and an interview with Rick Seigel, Director of Photography and Lighting Designer. It's a pretty wide swath of topics. The articles are pretty well written and informative. Again, free subscriptions are available. This is a new magazine that showed up on our doorstep a few months ago. I have to say, it is one of the most useful and informative video mags I've ever read. Every article was solid and educational, and they covered a wide range of topics. I learned more from that issue than from 6 months worth of other mags. From technical articles to equipment reviews to interviews with industry professionals, this one has it all. If you are doing video work in a ministry setting, this is a good one for you. Sadly it will cost you 20 bucks a year, but I would say it's worth it. So there you have it, a selection of my favorite new magazines for the moment. What about you, do you have any that you recommend? Leave a comment so we can all benefit!